We’re excited to introduce some new features to our call queue as well as soft phone and mobile web interface. First I want to introduce some new abilities to customize the waiting messages played while incoming callers wait to connect with your busy contact center. You can now add specific greeting messages that play after fixed amount of time to incoming callers coming into your call queues. In the past you would have had to create a larger custom audio file, but now you can do this by simply adding new greetings and providing specific wait times for each greeting through your queue set up. You can find it in the “waiting” section of the queue set up page. Its a great way to play promotional messages, provide suggestions for how to find help on your website etc. Next we’re excited to introduce our softphone call scripts feature. This allows large answering services to create custom scripts that pop into the softphone interface for each agent as they answer incoming calls, providing valuable insights into the reason for the phone call. For example, if you’re managing a call center that’s handling incoming calls for multiple businesses, you can set up different scripts for different business’s numbers being called and this feature will be immediately valuable as a method for informing your agents around the context of the incoming call. Am I talking to the gutter lead or the daycare lead? You can set this up by clicking edit next to a tracking number and going to the “agent script” area. Finally, we have a brand new outbound dialing interface for mobile phones using iOS. 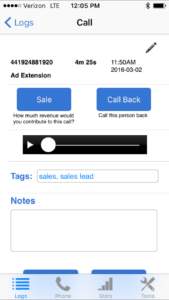 Many customers are already using our mobile site to keep track of their phone calls and now you can place outbound calls right from the mobile call log. All you and your agent’s outbound calls are then tracked, recorded and transcribed etc. You can then get a great sense of how many outbound calls are being placed, how they are going and they are still associated to the correct contact (and thus the original advertising channel that led them to you). We’re rapidly improving our product and feature sets. If you have ideas about what we should focus on next to better power you business and improve your tracking needs let us know!